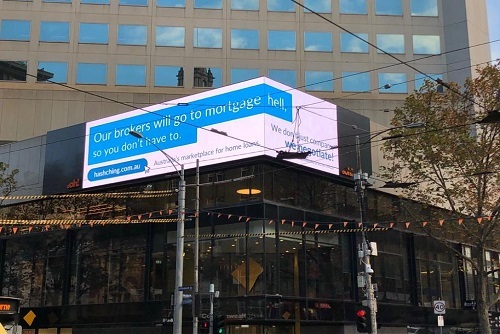 Mandeep Sodhi, CEO of HashChing, said the new billboard made light of the fact that applying for a mortgage or refinancing an existing one can be quite an onerous experience. According to the company, a large portion of HashChing’s customer base consists of borrowers refinancing away from CBA. A recent survey the group conducted also found that 70% of its brokers had seen an increase in customer enquiries about using banks other than the big four. HashChing’s anti-big-bank stance extends to its latest funding round. It is currently raising money by offering shares on crowdfunding platform Equitise. Money raised will go towards marketing campaigns like this. OMG!! Im surprised there isn't a shot of an inappropriate naked person included! To me, the normal person looking at this, will take it as an ad for CBA brokers and the branch below it. Nice one. How to do CBA a favour!